There’s brief bosoms, Profanities, and a pretty hot love scene between the late Powers Boothe and Jessica Lange. it’s interesting how a lot of members of the cast “turned out” in the years after the movie was initially filmed- Chris O’Donnell was right on the verge of big time movie stardom, Tommy Lee Jones was getting ready to go through a Renaissance, Annie Ross had her final film role in a bit part, Carrie Snodgress died sadly not long after, and Amy Locane who played Langes daughter ended up having a really terrible future in store for her. It was also the final film directed by Tony Richardson, who won best director for “Tom Jones”. He died of aids before it was officially released. I am, like, personally offended by how 31 DAYS extends into March 1, 2, and 3. Honestly, as awesome as SOPHIA is in TWO WOMEN, and as great as Natalie and Audrey are, I kinda can't help but feel like DEBORAH KERR gave the best performance by an actress in a lead that year in THE INNOCENTS. I know. 28 days is MORE than enough! 14 days is more than enough. and it revealed a real fissure in the status of women vs. men in HOLLYWOOD, the Best Actor that year was TOM HANKS in a little film you might not have heard of called FORREST GUMP that made seventykajillion dollars. an afternoon showing of TOOTSIE would be just enough. in commemoration of the 82nd annual Academy Awards. All rights reserved blah blah blah. I agree, I loved Deborah in THE INNOCENTS, such a spooky film and she is so believable as the governess who wants to help her young charges from the demonic forces which may or may not be haunting the place. Well, at any rate, great movie and great Kerr performance. I pretty much love her in anything. Always liked that movie, "The Innocents" and always meant to read "The Turn of the Screw" by James to be a little more informed about how he conceived it. Recently found a copy at the library and reading it really added to my appreciation of the film, though I think the book is better at conveying a completely unbiased view of whether she is sane or not. I was looking at the schedule earlier, and realized that aside from 9 films, I have seen all the other films playing from now through next Saturday, the end of the 31 Days. The picture reminds me of an episode of Family Feud I watched last night. 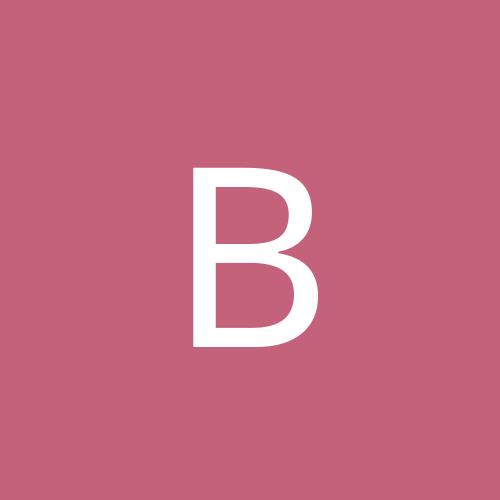 During what month of pregnancy does a woman begin to look pregnant? I enjoy Mickey and Judy's impressions of Franklin and Eleanor Roosevelt in Babes in Arms (on later today). Every time I see Goodbye, Mr. Chips on the schedule, I think of the Peter O'Toole "Word of Mouth" piece. Where. Did. My. Child. Hood. Go? Blue Sky, which I saw within the last year or two, is not a perfect film, but it is an Interesting one, that is for sure. The performances are on the whole, excellent, and Lange has a memorably showy part. It is one of the more overlooked Actress winners, but I am glad I saw it. Its a good solid mainstream drama, and watching it and many other major studio films of that period make me realize that among more modern (1980-onward) film eras, the early 90s were very rewarding years. Note, the film was originally filmed in 1990. 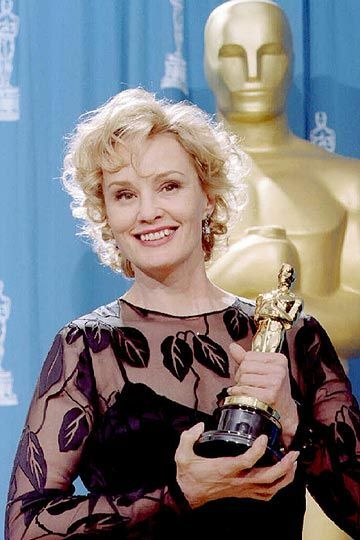 So Jessica Lange won an award for a film made several years before she won. Her competition when it did come out was Susan Sarandon (her future Feud co-star) in The Client, Jodie Foster in Nell, Winona Ryder in Little Women, and Miranda Richardson in Tom and Viv. Speaking of the 1990s, Dead Man Walking is on tomorrow night late. That is a brilliant, powerful film, and a must-see. IT IS?? Thanks for the heads up! I need to free up some space on the DVR! Saw My Man Godfrey quite a while ago, and must confess I don't recall Mischa Auer's character in the film. Was someone on this list robbed by the Academy? Friday: I haven't seen Dead Man Walking. Is that a zombie movie? Kidding, only kidding! Johnny Belinda has solid performances and strong direction and cinematography. Saturday: Bad Day at Black Rock has one of Spencer Tracy's best performances (I am not always one of his biggest fans), and the story, direction, and supporting cast aren't too shabby, either. 12:15 a.m. 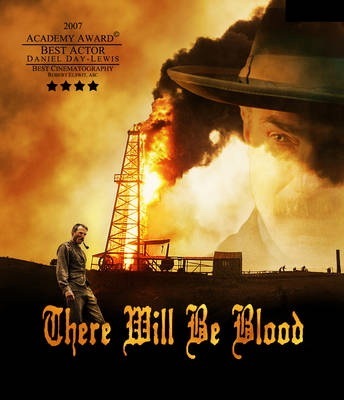 There Will be Blood (2007). With Daniel Day-Lewis and Paul Dano.